If you haven't been to an MLGW energy-savings workshop, you are missing out on some great ideas. Beverly Perkins, the supervisor for Corporate Social Responsibility, is great at what she does: helping customers save energy and money. Some of her tips are pretty common sense: set your thermostat at 68͒ in the winter, add blankets to your bed in cold weather, and wear socks walking around the house. But there's more! Beverly has DIY (Do It Yourself) ways to weatherize your home on the cheap. Like Dollar Tree and Walmart cheap. That's Beverly. Under the arrows, addressing the crowd. 1. DUCT TAPE -- Duct tape the cracks and gaps around windows and doors. Stuff old, plastic grocery bags or bubble wrap into the cracks first - they'll act as insulation. Once you've stuffed it's time to seal. Seal your insulation job with duct tape. It's not pretty but it will work. Duct tape is a Dollar Tree get. 2. LED LIGHTS -- As your light bulbs burn out replace them with LED bulbs. LED bulbs last longer than CFL bulbs (CFL's are the squiggly compact florescent ones) and are usually brighter. Plus, you can find LED bulbs at Dollar Tree. For real. and the pantyhose/wrapping paper trick was a great tip. 1. Cut one leg off the pantyhose. 2. Add both rolls of wrapping paper. 3. Pull the rolls of paper in opposite directions as you slide the whole contraption under a drafty door. The idea is to have one roll on the outside of the door, the other roll on the inside. The pantyhose secures them against the door and since they'll roll, you don't have to move them out of the way when you want to go someplace. Images are just so you know what the kits look like. We don't recommend one brand over another. 4. 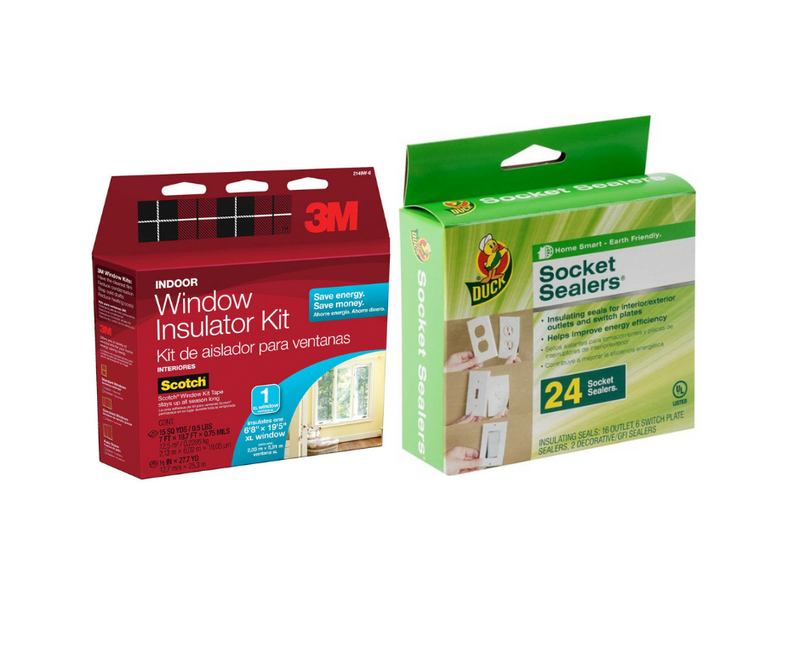 SOCKET SEALERS -- There's a chance you're losing heat around wall sockets as well. Cup your hand over an outlet in your home..do you feel a draft? If so, you want to pick up a pack of "socket sealers" at Walmart. They're made of fire retardant plastic and fit between the face plate and your wall. When installed correctly you cannot even see them. 5. 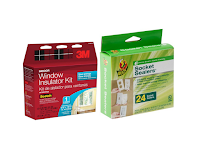 WINDOW INSULATION -- Aldi and Walmart both sell window insulation kits that come with the plastic sheets and tape you need to cover your windows and block drafts. Using a hair dryer or heat gun (not included in kit) will help shrink the plastic to your windows giving you a tighter, better looking fit. 6. BLACKOUT CURTAINS -- Also at Walmart...energy-saving blackout curtains. Curtain panels cost between $9 and $11 and will help block drafts in the wintertime. The bigger benefit is during summer when the black out curtains help block the sun and keep rooms cool. That's just six ways to save energy in your home - there are many more! Visit us online for energy-saving tools. Even better; come to the next MLGW weatherization workshop. Follow us to find out about upcoming events.